When you’re a child you don’t really know what to do with your life so you start dreaming. Little do you know then that your dreams can actually become reality if you work hard enough or get the right information at the right time. Therefore, in order to actually be the person you need and want to be, you must be motivated enough. So, here is a top 5 reasons why you should become an EU Official. If you are ready to change things not only for yourself but for others too! It is said that progress needs us as much as we need it. For it to actually happen, you must do something about it, because life does not have a habit of just happening and waiting for you to decide what to do. In a totally no selfish way of thinking, taking a job in the EU will actually help 500 million other people have a better life. How can such a thing happen? Consider yourself to be a pawn in a big table of chess and you will understand the mechanism better. The EU has been around for a very long time now, and in its almost 50 years of life, it has proven to be an advocate of freedom, character and diplomacy. Basically, the European Union is one big happy family providing for all its citizen. Being a member of this community helps you become what you always dreamed of and others to, because of your job as an official. Union means every single citizen standing together for each other. Depending on your education, skills and of course, on your personal experience in the work field you are planning to evolve in, you can get a job in managing different projects, developing communication strategies, providing legal advice and many-many others. You can have a better salary and be a flexible and modern employee. Of course, you have to think about yourself as well as about others and in order to get to help other people, you must first learn how to help yourself. The first thing you need in this world is enough money to get by. Having a job as an EU Official may improve your income. Not to mention that you will still have better benefits as you did with your old job in your own country, like pension and healthcare assurance. If you have children, your new situation will provide for them in terms of allowances for school, transport and other needful things. Besides, there is always a way to find new information on time, so you can profit. Self-respect is a very important ingredient. The third reason why you should definitely become an EU Official concerns your self-esteem. Every psychologist in the world will advise you that this is a very important aspect of having a happy life. Such a job can motivate you enough to want to do even greater things and boost your confidence to an upper level. If you want to always have a reason to wake up in the morning, you must never be content with the knowledge you have and always want to know more. Having a job as an EU Official can help you in this area, being able to develop your skills and maybe even learn some new ones. Always be in the middle of things! Being in the middle of all the action can be a very energizing. Of course, nowadays, Europe encounters a lot of difficulties because of its migrants problem, but look on the bright side: the chaos must end one day and then you can actually tell to the people you know how you’ve been a part of this and maybe even helped things by having a EU Official job. Be in the middle of history by participating and helping as much as you can. In conclusion, you can improve yourself with knowledge, self-esteem, a good financial situation and the satisfaction of always helping others to have a better life. Those should be sufficient reasons for you to consider having a job in the EU, as an official. 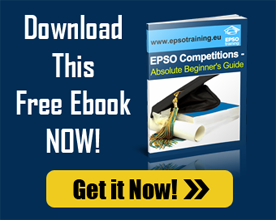 To help you achieve your dreams, Epsotraining prepares you for all EPSO Exams.